If you’re anything like me, you always have to have the latest and greatest piece of technology. Unlike me, though, you may not be eager take that shiny new gadget and unlock, root, install a custom OS, or brick it in the name of progress. Rooting an Android smartphone and installing custom firmware is always a risky proposition, and by doing so you void your smartphone warranty and may even render the device inoperable. Please be careful when trying to root your phone, as PCWorld cannot be held responsible for the consequences if you accidentally brick your Galaxy Nexus in an attempt to make it more awesome. Of course, Samsung’s Galaxy Nexus (with Google's Android OS and Verizon as carrier) is already a pretty awesome smartphone; it may be the best phone currently on the market, and it's certainly one of the best smartphones Google has ever endorsed. ClockworkMod running on a rooted Galaxy Nexus smartphone. That said, there are always things you want to do to make your phone work a little bit better. The Samsung Galaxy Nexus running stock Android won't let you tweak how the notification LED works, for instance, and at this date you can’t run a full backup in stock Android. Also, Google Wallet has been blocked by Verizon, and if you're a Verizon subscriber you may want to try it out anyway by hacking your phone. Those plus at least a hundred other reasons are why you should unlock and root your Galaxy Nexus (though it's possible to install carrier-blocked apps without rooting your phone if that's all you're after); installing custom firmware is a great way to get the most out of your device if you do it right. To help you do that, I've put together a step-by-step tutorial on how to root a Galaxy Nexus. As a little bit of prep work before we start, though, let’s run through the basics. You need to have the Android SDK package installed for whatever operating system you have running on your PC. If you don’t have it installed, you can find simple instructions for doing so at the Android SDK website. In particular, make sure you have the fastboot and adb files installed on your PC before you continue on. Please note that these instructions are meant for the Verizon CDMA version of the Galaxy Nexus, though other versions probably require the same process (just different files). The first is the image file you’ll be replacing your stock image of Android with to allow you to root your device. The second is the file you’ll "flash" (install, basically) to your phone to actually gain root access. Now that you have those files and the Android SDK, let’s get started. Please note that you must wipe your phone back to factory default during the rooting process, so make sure to back up your data beforehand. Check out our guide to backing up your Android phone for tips on how to make sure your data doesn't disappear. 1. Turn off your phone and boot into recovery. You do this by pressing both volume buttons and the power button at the same time. Your phone will vibrate, and then boot into recovery. 2. Plug your phone into your PC. 4. Next, type fastboot flash recovery recovery-clockwork-5.5.0.4-toro.img -- this flashes the custom image over your stock image, paving the way for your device to be rooted. 5. Finally, type adb push su.zip /sdcard/ -- this uploads su.zip to your phone (make sure to include the trailing /). At this point your phone should be in Recovery Mode, so choose the option for “install a .zip from the sdcard,” and install su.zip. That’s it; reboot your device, and it should be unlocked and rooted. It will also be completely wiped, as stated. 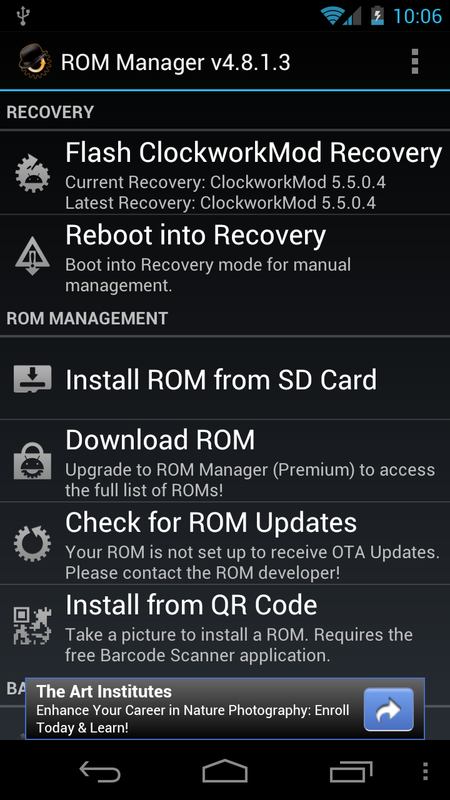 You should see an "install zip from sdcard" option in Recovery Mode regardless of whether or not you use ClockworkMod. That first boot can take up to 10 minutes, so give it some time to do its work. From here you can install any custom Android ROM you like. I installed Codename Android, and I’ve been pretty happy with the overall performance boost I saw after installing it. In order to install custom ROM software, you just put the zip file on the sdcard and boot into recovery; I did so straight through Clockworkmod. After a reboot and some time for the first boot, I was in business (though the phone was wiped again, of course). If you're looking to try a few popular Android ROMs to see which you prefer, take a look at our recently published Android ROM Roundup. Good luck, and happy hacking!